Imagine the worst thing that has ever happened to you, happening every day for twelve years. Then subtract your house, your clothes, all of your creature comforts, and all of your free will. This is what 12 Years a Slave is. Solomon Northup is a musician who lives in Saratoga, NY with his wife and two kids. When his wife and kids go away to cook for a big event for a few weeks, Solomon is approached by two men who convince him to come on tour with their "circus" troupe in Washington DC as a musician, assuring him that he'll be handsomely compensated for his work. But after Solomon eats a meal with them and gets sick (from drugged wine), the next day he wakes up shackled to a wall. Trying to reason with his captors, he tells them he's free and threatens to press charges. But his papers have been stolen and, being in the South, the chances of anyone believing his story are nonexistent. The next twelve years he works as a slave, first on a property with a kind (ish) master, and then next with a raving lunatic. 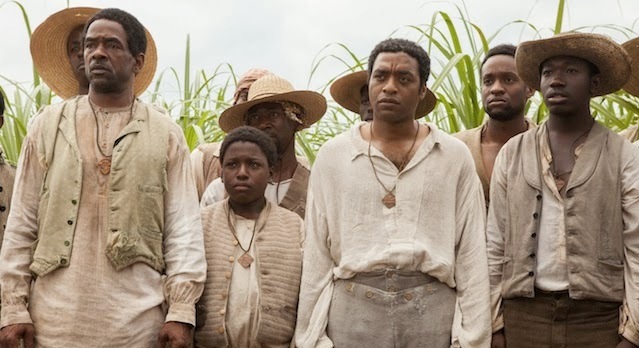 The movie serves as a brutal reminder of the horrors of slavery. I mean, even when you read the title of this movie, you know it's going to be rough. Personally, I'm very happy I had the foresight to bring tissues this morning. But the subject matter is made infinitely more infuriating when your coming from a somewhat sympathetic view of the main character. I have never been a slave, and (well, who knows with the government the way it is at this point in time) I will never be a slave. However, as someone with a decent social standing and a job that pays the bills, I cannot imagine waking up chained to a wall, sold to another human being, and not being allowed to have an opinion about anything anymore. 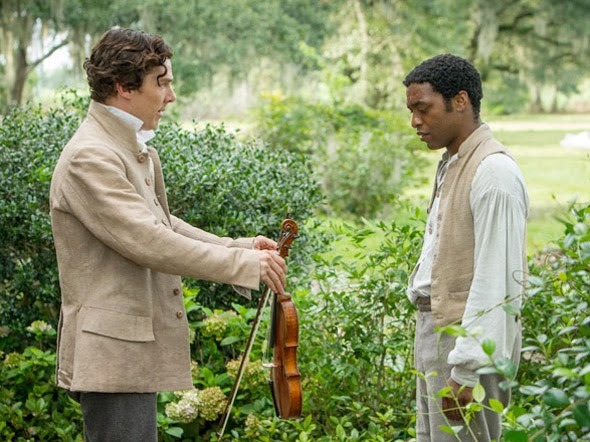 This is where 12 Years a Slave really messes you up. It's absolutely horrifying to think that we live in a country where this used to be commonplace, and the movie is very faithful with it all. On an errand, Solomon veers off the beaten path in a moment of hope that he'll be able to run away, only to be met by a lynch mob that only leaves him alone because they see that he's owned by someone. How. Did. People. Get. So. Awful. But they delve into this issue too. As one character mentions, white men who own slaves either have to put the moral element somewhere in their mind tucked away and not think about it, or else they have to drive it away with whatever means necessary. Solomon's first master is an example of the former. Master Ford (Benedict Cumberbatch) is a kind man. Solomon is at first candid with him, sharing ideas of how to maximize the transportation of their timber. And he is even admired for being a smart man. And gets a free violin. But when a jealous and ignorant assistant to the overseer tries to mess with him, Solomon has no idea how to be passive and then has to move to his next master, Master Crazy (Epps). Epps (played by Michael Fassbender) gives people lashes when they don't pick as much cotton as they did the day before. He wakes up the slaves in the middle of the night and orders them to dance around his living room (on more than one occasion). He appears once or twice without pants on. And his temperament is absolutely poisonous. Including him almost murdering Solomon at a few different times. Perhaps the thing that makes this movie so extremely hard to watch is the fact that no one, not even nice people, will help him. Placing his trust in others, Solomon is frequently burned, and in increasingly extreme ways. At times you see that he feels totally helpless, but never is he completely resigned to his fate as a slave. Throughout, he tries to find ways to remind himself of who is truly is underneath the guise of "Platt," his slave name. Another incredibly well-acted element is the transition that he has to make between being the educated man that he is and saving his own life by feigning ignorance. While in the beginning he uses an elevated vocabulary, by the end of the film you can hear a Southern drawl come to him naturally, and he chooses his words to be careful and simple. Very, very heartbreakingly well-acted by Chiwetel Ejiofor. Well done, sir. 8 outa 10. Cried myself dry.